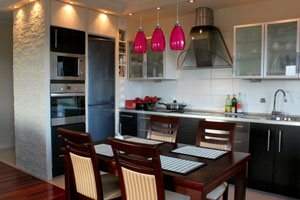 If you are remodeling your Houghton Lake kitchen, you should consult with extremely knowledgeable retailers to ensure that you make the best material choices. In Houghton Lake, the kitchen design experts at Kabinetree Koncepts have been helping local residents remodel their living spaces since 2003. Their kitchen design specialists has the knowledge, skill, and experience to help you throughout all stages of your project. They have offered the following guide to help you start thinking about the flooring that you will place in your Houghton Lake kitchen. Stop by their showroom to see far more options and receive in-depth advice. When Houghton Lake residents think of kitchen flooring, they often completely overlook the possibility of having hardwood kitchen floors. However, because there have been substantial improvements in both products and sealers, hardwood is not just a viable option, but it is also an exceptional choice for your remodeling project. If you have an open floor plan and want a seamless transition between your kitchen and living spaces, hardwood kitchen flooring may be the best choice for your Houghton Lake home. Ceramic tile provides a great deal of design flexibility to Houghton Lake homeowners during remodeling projects. This flooring option comes in countless sizes, shapes, colors, and styles. As such, you get to choose a unique flooring option that is just right for your aesthetic tastes. After installation, you do not need to fuss over your ceramic tile flooring. These materials are highly durable and low maintenance. The kitchen design experts at Kabinetree Koncepts suggest using large pieces for a more seamless look. If you are looking for a truly classic look, natural stone flooring may be the best option for your Houghton Lake kitchen remodeling. These materials are highly durable and extremely easy to clean. They come in a variety of different colors, shapes, and sizes, so natural stone flooring can match any comprehensive kitchen design scheme. Kabinetree Koncepts can help you choose the natural stone flooring that your Houghton Lake family will like best. As manufacturing processes continue to get better, vinyl kitchen flooring improves dramatically. Today, there are vinyl kitchen floors that can mimic nearly any stone, tile, wood, or leather pattern. Best of all, vinyl kitchen flooring is extremely easy to clean and budget friendly. You can truly beautify your Houghton Lake kitchen with new vinyl floors. If you need to hire a bathroom design team or to purchase high quality plumbing, cabinet, flooring, or countertop materials in Houghton Lake, call Kabinetree Koncepts at 989-422-3545, or complete our online request form.